Have you wondered how well you are communicating the Faith? Even if you are not a parent, but you have a certain restlessness to dive deeper into Tradition, you are not alone. There are many blogs, reading lists, and other resources that provide a wide array of activities to help us become more aware of the seasons on Church calendar. There seems to be an infinite number of corresponding traditions. With the help of several friends of the parish, we have put together a tool that may aid in beginning this process. The last thing we want to do is overwhelm ourselves. We also do not want to tack more items on to our “To Do” list. Rather, we identified several things that an individual or a family already does. On the monthly flyer, we highlight key ways to enter into the season with intentionality. We already celebrate and make sacrifices. With slight modification, the tool may help us grow in our awareness of life infused with the life of the Holy Spirit. You may notice already that quite a lot of the Mass liturgy includes signs of the seasons we travel through. 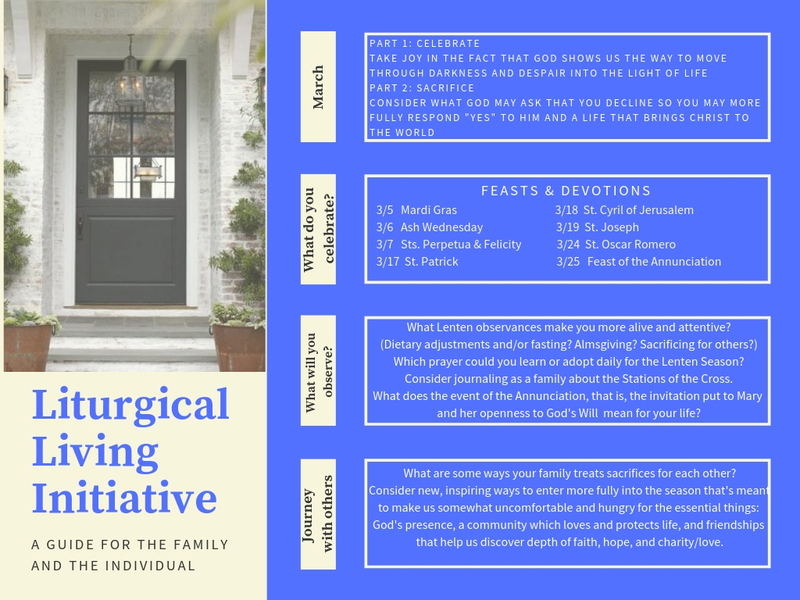 Since the Mass is a given starting point that helps us more faithfully look at what we do daily, we call the tool our Liturgical Living Initiative. Pull out your flyer. Click on the month below to find the appropriate flyer. Take a look at the different boxes for suggestions for the month. To start off, consider following the suggestions. Or, do your own search! Are there any saints who have influenced those under your roof? How could you grow in familiarity with them? What are fun ways to remember him or her? Are there moments of rest when you may offer up a family prayer or talk about what each one finds to be interesting from the weekend Gospel? Month of interest The month will be listed and at the top black tab. Boxes on the right side of the sheet provide a few details about what is occurring in a given month. In the top corresponding box you’ll see a description of the theme we would celebrate that month as well as the date(s) when a sacrifice or offering is fitting. What do you celebrate? At least one corresponding feast and a reflection or devotional will be given. Then, we can become more familiar with the saints and ways to observe a season. There are SO MANY ways an individual or family may adjust daily or weekly activities according to the theme or feast. Example for September: Incorporate raisins, grape juice, or other crop into your meals. Choosing and discussing what is harvested and sold to us help us celebrate and remember the season, and, in this case, the offering we make during the Eucharistic Feast. Kids especially liken food to feasting, but surely decoration, music, or mini excursions to a particular destination where we witness the season are a help to us. Journey with others At the bottom of the flyer you may find further examples that are easier to do with others beyond the family circle. We make memories with greater awareness of God calling us to know Him and to enjoy the company of others.